Slang is everywhere and exerts enormous power. Buffy did more than ward off vampires. Cool, wicked, chill, dope, nerd. Young people around the world use this kind of slang to show they’re connected to American pop culture. Slang’s main social function is to signal belonging: American slang marks the speaker or writer as an active and informed member of global youth culture. Be it Italy or Indonesia, words and phrases for groups or music styles (rapper, east coast, gangsta), music production (sampler, loops), or key cultural concepts (battle, freestyle, dissing, realness) are part and parcel of youth culture everywhere. Vernacular English is powerfully expressive because — paradoxically — it is both exclusive and global. In any host society, American slang lives in a world of linguistic and cultural knowledge not available at school or in mainstream media. (This also holds true for Jamaican English slang which is popular among fans of reggae and dancehall music.) American slang lives in the specialized media of the young, such as CD booklets, songs and video clips, magazines and Web sites. Through the media, young people enter fan communities where they learn to incorporate certain forms of English into both their speech and writing to show that they’re a part of youth culture. As a result, American slang and related resources have become a global code for youth worldwide embedded in a local code — the national language. When host languages incorporate slang and jargon, speakers inflect loan nouns and verbs just like native items and build compounds of English and native nouns. For instance, flipped out comes as ausgeflippt in German, flippato in Italian, flippé in French, and fliparisménos in Greek. In German, English verb phrases are partially translated, yielding abchecken (check out), ausflippen (flip out), abhängen (hang out), abrippen (rip off), among others. Interestingly, American loanwords are easier to integrate into German. This is probably because German is more closely related to English than say, French or Hungarian. And since American culture is considered highly prestigious among many Germans, American loanwords are absorbed into German culture at a high rate. How American slang is used abroad quickly signals social identity. For example, while items such as hi, cool and cu ( as in ‘see you’ ) are spreading into general German slang, openers such as aight heads have a specific social meaning among hip-hop enthusiasts. They identify writer (and addressee) not only as trendy young people, but as members of the same fan community, (in this case, Hip Hop). Youth around the world draw not only on slang, but other linguistic resources such as conversational routines, slogans, non-standard spellings, and code-switching into English to signal group identity. In the example below a Dutch writer uses hip-hop to address other hip-hop enthusiasts in Germany. The choice of slang conveys a cultural affiliation between writer and addressee. The linguistic signaling of identity is achieved not through English in its standard form, but through specific English lexical and conversational choices. Equally interestingly, what is perceived as slang in a new context need not always be slang in the donor language. Youth music cultures are fond of English conversational routines, which serve as ready-made solutions for particular situations. They’re the “right thing to say” by community or cultural norms. English routines are embedded in the host language in a variety of ways. While many are no longer considered slang in the United States, they're considered "youth speech" in the host languages. various “chunks” — no way! that's all! I'm ready! let's go! shut up! English routines are innovation-friendly patterns, which make it easy for speakers to “freshen up” their language through individual word fillings, modifications and extensions. A case in point is cu (‘see you’), one of the most popular farewell expressions on the German-speaking Web. Besides the base form (cu, cya, see ya), it comes in variations such as CYA Peace / See ya, aloha / cu bis denne (‘till then’) / CU & Bye bye / cu l8er / cYa soon / cu soon and there / CU@NIGHT, etc. Slogans are ready-made phrases that express youth-cultural values, beliefs or affiliations (e.g. underground will survive), and often invite the reader to join an action or follow a moral conduct (e.g. keep on rocking; keep the graffiti real; support the local scene). Routines, slogans and props allow non-native users of English to do more with less: They can use (or appear to use) idiomatic English without any bilingual competence. Routines are important to ritual communication, allowing participants to reaffirm their relationship as members of the same youth culture. Certain slogan patterns have appeared in virtually all music youth cultures since the 1980s, while others are restricted to one particular scene, such as “props,” a common hip-hop declaration of respect. In the German-speaking context, props consist of the performative item (props or equally peace, shouts, respect) and the name of the addressee, as in: yo backschpinners!! dicke props aus österreich ...!!!!! (‘Yo Backspin people! Fat props from Austria’). Some props are completely English (e.g. peace II da realheadz) while others are grammatically assimilated, as in PEAZ an alle aktiven (“peace to all actives”). English in youth music cultures extends beyond the lexicon, with code switches often involving the same types of conversational routines, slogans or props as mentioned above. In other cases, a switch to English can emphasize an argument. For example, an interviewee switches to English to express his desire as an entertainer to give the people what they want. The speaker calls this switch his “motto,” so it’s probably a ready-made phrase or quotation. The switch emphasizes the propositional content, and perhaps conveys a kind of global validity, a stance that is not restricted to a particular national origin. When spelling variations are originally restricted to English words, some youngsters creatively transfer them to their mother tongue (provided the two languages are similar enough). In Germany, spelling transfers go back to early 1980s punk culture, when the spelling variant x, as in the word punx, appeared in German words. In the 1990s, the trend was repeated in hip-hop, with spellings such as ph, -z and -a/-ah jumping to German words with roughly the same meaning. When they turn into purely visual distinctions, their original phonetic value is sometimes lost. For instance, with brudah, the German word Bruder (‘brother’) receives a ‘hip-hop’ spelling for the -er ending. Another example is N8 for Nacht (‘night’), modeled after sk8 (‘skate’); here the spoken sound of “8” is different in English and German, but the technique remains the same. Framing refers to the linguistic design of the beginning and/or the end of a block of text, such as a magazine feature, a record review, a letter to the editor or a guest book entry. Framing indicates that the enclosed text is part of a particular discourse. American slang, routines and slogans are often used for this purpose in youth culture, the main text being in the national language. For instance, hip-hop magazines commonly conclude reports, reviews and interviews with the phrase word up! Slang, spelling variants, routines and slogans are often used for emblematic and framing purposes, standing apart from the main text in a highly visible position. Examples are names (nicknames, Web site names), logos, headlines, navigation bars (on Web sites), and signatures (in emails or newsgroup postings). When English slang, routines and code-switches appear, their quantity and quality depend on media format and genre. Magazines contain more major-class English loanwords and guest books contain more conversational routines and code switching. Major-class words (nouns, verbs, adjectives) make up almost all English items in magazines, but just over half of the English items in guest books. 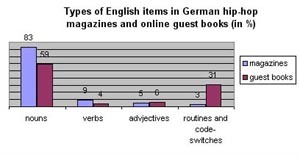 In contrast, routines and other chunks represent one out of three English items in the guest book sample, but only three out of a hundred items in the magazine sample. Switches in magazine texts follow standard practices of media discourse, such as switching for quotations, allusions or emphatic repetitions. On the other hand, switches into English in guest books include more dialogue and expressive elements and a stronger use of vernacular English. These differences reflect institutional differences between print media and the Web. The Internet increases the flow of American slang into other languages because it is less restrictive than magazines in terms of language style and because it creates an interactive space for playful talk and self-presentation — in which slang, routines and slogans can play a big role. American slang has a global currency in youth-cultural contexts. It is not transmitted through the institutional teaching of English as a Foreign Language (EFL). Rather, it is the outcome of rapid linguistic transfer via non-curricular sources, reaching German teenagers before entering English-language dictionaries. Vernacular English has very different pragmatic and sociolinguistic values from institutional EFL. Its attractiveness rests on emotional and peer-group related values rather than purely instrumental ones, such as English as a job-related tool. However, American slang does not threaten institutional EFL. The relationship is best viewed as complementary, both linguistically and in terms of language attitudes. Knowledge of slang extends the knowledge of English with respect to particular semantic fields and speech styles. Although slang could never substitute for EFL in its instrumental value, it clearly connects foreign-language learning with adolescent cultural experience. This article is based on research studies published in 2002. Adams, Michael. Slayer Slang, Buffy the Vampire Slayer Lexicon. Oxford University Press, 2003. Dalzell,Tom. Flappers 2 Rappers: American Youth Slang. Springfield, Md: Merriam-Webster Inc.,1996. Eble, Connie C. Slang & Sociability: In-group Languages among College Students. Chapel Hill: University of North Carolina Press, 1996. Jannis Androutsopoulos is Junior Professor on Mediated Communication at Hannover University, Germany. A native of Athens, Greece, Jannis studied Germanic Linguistics and Translation Studies at the Universities of Athens and Heidelberg, and holds a PhD in Germanic Linguistics from the University of Heidelberg. From 1998-2000 he was a post-doctoral research fellow of the German Science Foundation with a project on mediated communication in youth culture, and from 2000-2003 he was a research fellow at the Institute for the German Language in Mannheim, working in a research group on 'Language variation as a communicative practice'. Jannis is a specialist in youth language and mediated communication in youth cultures, both in Germany and from a comparative point of view. He has published extensively in the fields of sociolinguistics, linguistic text analysis and media discourse in German, English and Greek, and taught seminars at the Universities of Hannover, Heidelberg, Mannheim, Berne, Budapest and Frankfurt. His current research focuses on language variation in media discourse, the sociolinguistics of computer-mediated communication, and the analysis of multimodal texts. His recent publications include the volumes Discourse constructions of youth identities, co-edited with Alexandra Georgakopoulou (Amsterdam: Benjamins, 2003), and HipHop: Globale Kultur - lokale Praktike' (Bielefeld: transcript, 2003).